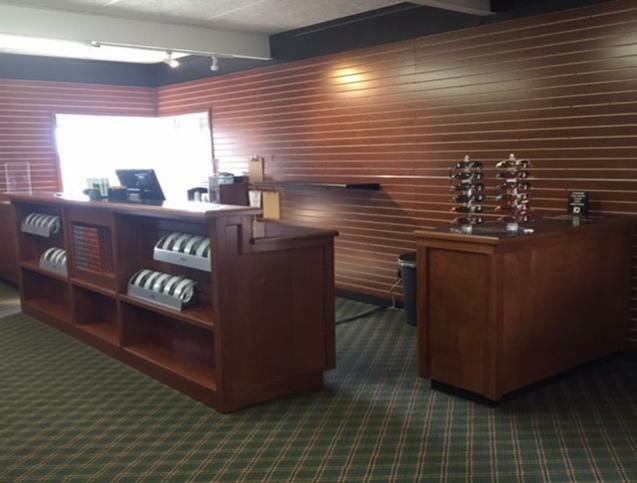 New pictures of the progress going on in the Golf Shop. New slat wall is installed and the new counters are here. As you can see, inventory is slowing starting to arrive. By the time we host our 1 Person Spring Scramble on April 8th, the golf shop will be full of new and fresh merchandise. I ask everyone to please review the back of this newsletter for information regarding our Spring Scramble. Something new this year is an early bird sign up for all Club tournaments. If you sign up and pay the entry fee 1 week prior to the event , you will pay $10.00 LESS than if you wait until the final week of the event. This helps 2 fold, first, it makes planning and scheduling of the event much smoother and second, the extra fees collected from the event will go into a separate account to help pay for new bentgrass seed for our greens. Per a USGA report done on our greens, we need to change the grass profile to a more heat tolerant and newer variety to help soften damage done by the summer stress. I look forward to seeing everyone out on the Links! From our last posting, we are still trimming trees and bushes, performing annual maintenance on the course equipment and readying the course for spring. The unseasonable temperatures this February has pushed our normal schedule ahead a month. We have also fixed all major leaks in the watering system, raised some sunken heads, moved a leaking valve from the end of 16 fairway that has plagued us for years, and as of this posting, filled the system with water with no leaks detected. This is extremely important to have done at the beginning of the season, because of the age and lack of shut off valves in the system, which prevents us from shutting it down during the summer months to repair. Besides starting a seed fund as mentioned above, you will notice this season that we will be verti-cutting and top dressing the greens more frequently. This is done to help reduce thatch layer and promote a more uniform rolling surface to putt on. This practice we started last year when the Club purchased of a new topdressing machine which minimizes its footprint around the banks of the greens. We hope to see gradual improvements as we continue this practice. Finally, spring aerification is around the corner, the course will be closed on Monday, April 3rd for this procedure.